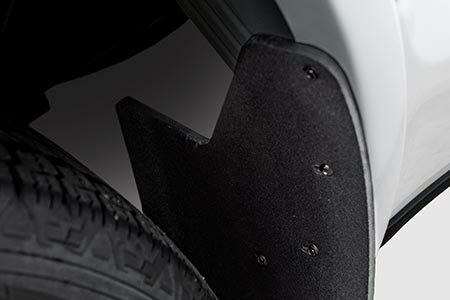 ROCKSTAR™ Model Specific Splash Guard Mud Flaps are designed for the perfect fit with factory cut mounting holes to easily and quickly install in minutes. Built from durable composite rubber for additional strength and to prevent the formation of mud and snow build-up. Select between full size 23 and 20 in. or midsize 18 in. for the best combination of fit and function. The model specific ROCKSTAR™ Splash Guard Mud Flaps are furnished with polished trim plates or without for a subtle appearance. 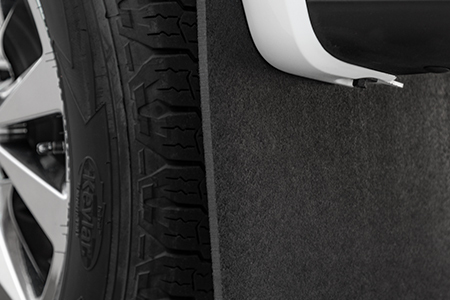 Don't get caught without model specific ROCKSTAR™ Splash Guards Mud Flaps on your next adventure. Built for the perfect fit with model specific, factory cut mounting locations. Offered in 23, 20 or 18 in. lengths. Black mounting hardware included. Extruded for additional strength and pliable to -40° F. The flat exterior prevents mud and snow build-up. Our rubber won’t distort the color of your truck. 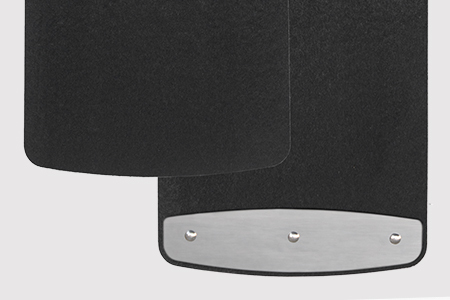 Select between factory installed, polished stainless steel trim plates or without for a subtle appearance.